Back in the day, we all used to be blown away by just being able to exchanges text messages through our mobile phones as if chatting on the computer, for free, using Internet data. Since when, I don’t exactly remember, all the characters that express various emotions started to fill the screen of messenger apps instead of text, and along with these interesting characters, the act of chatting soon became a form of entertainment, beyond a mere tool for communication. Not long after, these characters featured in chat rooms turned into a classic example of One Source Multi-Use content, which could be utilized in endless ways. Line Friends, a character brand featured on the global messenger app called Line, was launched as a tool for replacing texts and emoticons, and then soon the brand developed into a charming content field of its own. Initially a mere idea, the brand and its economic value were reevaluated as it emerged as an iconic set of characters that represent the endless possibilities for such content to grow and become popular. 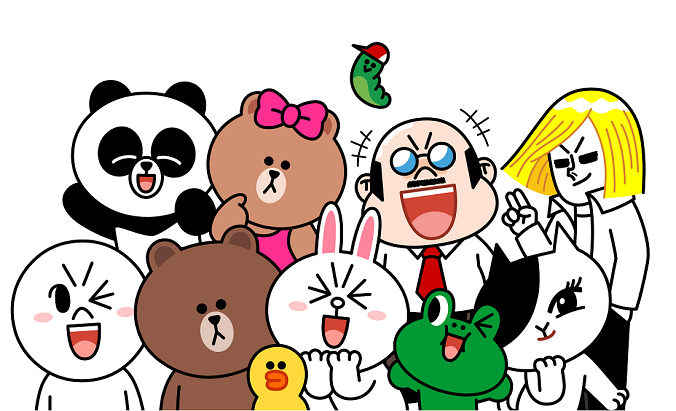 Now the Line Friends characters, officially used by more than two billion users across the world, were brought out to this world as emoticons on the mobile messenger app Line. In October 2011, four original characters, Brown, Cony, Moon, and James were first introduced to the public, and five other new characters, Sally, Edward, Jessica, Boss, and Leonard, were later added. In March 2016, Choco, introduced as Brown’s younger sister, and Pangyo, an IT genius panda, were also added, completing the lineup of 11 original characters in total. The charms of these characters are their cute design that highlights the design capability of Line Friends creators and their storyline that sparks empathy and familiarity among the public. Users are amazed by the cuteness of the characters and come to feel the characters as their close friends as they sympathize with the interesting stories based on the different birthdays, personalities, and hobbies of each character. These charms and stories re the main reasons users around the world look for Line Friends stores, take photos with the characters in the stores, and share their photos on their social media accounts, as if they bumped into their close friends. Based on the vivacious characters and their well-written stories, Line Friends produced animated series featuring the characters in major roles, creating another popular hit. The animated series drew much attention for very same characters people used as a tool for expressing their emotions on messenger apps, now moving and talking in front of their eyes and bringing great entertainment. LineOffline Salaryman, an animation series that described the agony of work life through the characters of Line Friends, drew much empathy among ordinary workers. The 114 episodes of the animation aired from January to September 2013 through TV Tokyo in Japan and aired again in Malaysia, Thailand, and Taiwan. Line Town, another animation series, portrayed everyday scenes from Line Town, where all the Line characters live together. The series first aired on TV Tokyo in March 2013 in the prime time slot, which even Japanese shows struggle to secure. Now we live in an era where a well-made character is better than 10 programs. First introduced to the public as messenger characters, Line Friends were able to enter into international TV markets and foster collaborations with globally renowned brands, having a new opportunity to take their product to another level. The collaborations were acclaimed as collaborations that could have been achieved by Line Friends. For example, Lamy, a German brand of premium writing instruments, first produced a collaboration edition of their products with Line Friends. It was the first collaboration for Lamy in history since its establishment in 1930, which shows the brand awareness and influence of Line Friends on the international level. A Brown limited edition pen produced through the first collaboration between Lamy and Line Friends sold more than 15,000 units on its first day of sales, which was a huge record. The Lamy Black edition, a recently rolled out product, has been gaining very high popularity among consumers with its sophisticated design and elegance. Moreover, Line Friends has gradually widened its stage through continuous collaborations with global premium brands such as Brompton Bicycle, the British premium brand of folded bikes; L’Occitane; and Mr Maria and rolled out new products that continually draw consumers. Starting in 2012 in Japan, the licensing business of Line Friends has developed around 5,000 different products and now has licensing contracts in various countries including Thailand, China, Taiwan, and Hong Kong. Collaborations with the brands targeting young women in their 20s and 30s such as Missha, Mediheal, and Mentholatum especially performed well in sales. The Line Friends × Missha edition launched in 2016 immediately sold out in Korea. Able C&C, the cosmetic company that owns the brand Missha, saw a 20 percent increase in sales this year compared with last year and was able to sign more contracts in various countries in Asia. Line Friends did not stop there. McDonald’s China became an official sponsor for the 2016 Olympic Games and carried out promotional campaigns for the games with Line Friends. This interesting collaboration received a much greater response from the public than expected, which led to another collaboration between the two companies for McDonald’s New Year promotion in 2017. In Hong Kong, Line Friends signed a licensing contract with fashion giant I.T. Group, rolling out Line Friends apparel and general merchandise products through collaboration with the company’s prominent fashion brands :Chocoolate, ete!, and b+ab. In the meantime, Line Friends also presented its brand products in Japan and Southeast Asia through collaboration with the famous Japanese apparel brand Uniqlo, recording more than a 130 percent increase in sales for domestic licensing in 2017 compared with that of 2016. BT21, a project created through a combination of the charms of Korean Wave stars and the strengths of characters, was another turning point for Line Friends. BT21 is a collection of new characters created by a collaboration between Line Friends and BTS, the global boy band. Departing from typical collaborations, in which appearances and names of the artists are directly borrowed for use, all the members of the band participated in the creation process for the BT21 project from the initial sketching stage, to setting up the personalities, tastes, and values held by the characters, and to bringing the characters to life. Eight charming characters were created from this project and received much attention from the public. Across the world, fans of BT21 showed enormous support and interest, far beyond what had been expected. Since the BT21 stickers were released in September 2017 on Line, they have been downloaded more than 20 million times, and the official BT21 social media accounts have gained more than 11 million followers and subscribers. The BT21 Twitter hashtag has exceeded more than 45 million uses, showing the great popularity of the brand. Fans around the world have given enthusiastic support to the new characters that embrace the originality and charms of BTS and the unmatched design ability of Line Friends. Since the BT21 character products were first released, merchandise has immediately sold out online and offline every day, which attracted much attention. On December 16, when the BT21 character products were first released at the Line Friends store in New York’s Times Square, a record-setting 35,000 fans visited the store during the day, despite the cold weather. The same happened at the Harajuku store in Japan, which was opened on March 17. On that day, the BT21 line was officially launched in Japan, and about 5,000 fans visited the store, bringing attention to the project and its popularity. In April this year, Puzzle Star BT21, a block action puzzle game featuring BT21 characters, was launched across the world and drew much attention. The puzzle game created a buzz even before its official launch, as its teaser and the intro video were viewed more than 100 million times and became the number one free-of-charge game in the app store rankings in Korea, Japan, Singapore, Taiwan, and Indonesia one day after its launch date. Two days after the launch, the game has exceeded one million cumulative downloads worldwide, attracting much attention from the industry once again. Line Friends launched 105 stores (based on the accumulated number of stores opened as of April 2018) across the world, including stores in Seoul, New York, Shanghai, Beijing, Hong Kong, and Tokyo. The global brand sales in 2017 amounted to KRW 126.7 billion. Achieved just in three years after spinning off into an independent corporation in January 2015, these records demonstrate thegrowth of the global character brand Line Friends, which is just amazing. The brand also plans to expand its contact points with consumers in additional areas in the future and strengthen its brand competitiveness. Line Friends’s efforts to discover new forms of intellectual property are ongoing. In July 2017, it co-produced the animation Running Man, created based on SBS’s leading variety show Running Man and distributed domestically and internationally. As well as creating initial characters, Line Friends actively participated in the planning process for storylines, which is another example that shows its creativity in another way beyond a simple character production. The animated Running Man, a fantasy action series, has been broadcast on various video platforms such as cable TV, IP TV, and YouTube since late July last year. The show will be expanded to all regions of Southeast Asia including Japan, Hong Kong, Taiwan, and Thailand. Thanks to its popularity, Line Friends has been also approaching consumers through licensing and collaboration merchandise using its Running Man characters. In addition, Line Friends’s new Friends Creators project, released amid the spotlight in September last year, was praised after it was introduced to the public for writing a new chapter in the history of the character business. Friends Creators is an original and creative project implemented by Line Friends, combining its competencies and assets of the character business with the creativity of domestic and international artists working in various fields to create new character concepts. This project demonstrates the willingness of Line Friends as an innovative content creator to create characters that are unique and embrace artists' originalities and charms through long-term projects. It also shows that Line Friends is committed to developing a new strategic intellectual property lineup to expand its content business into various fields such as merchandise, animation, games, and music and strengthen its character business. Starting as a messenger emoticon brand, Line Friends has grown into a global character brand that boasts a solid base of fans thanks to its smart strategy. In this strategy, the company focused on developing original characters, the most powerful asset of the brand, and maximized its capabilities in areas in which the influence of the original characters can be maximized such as licensing and collaboration. Based on its global popularity and brand value, Line Friends will continue to create new character lineups and expand its collaboration efforts with various other brands. Line Friends has become a global wonderland that provides a barrier-free experience to users all around the world. Now many people are interested in and looking forward to seeing how the company’s will next surprise the world with new characters and business expansion.